A Climate Realist’s (not so) short Answers to Hard Questions About Climate Change. Question 3 (of 16) Is there anything I can do? – Len Bilén's blog, a blog about faith, politics and the environment. A Climate Realist’s (not so) short Answers to Hard Questions About Climate Change. Question 3 (of 16) Is there anything I can do? Justin Gillis answer to Question 3. Is there anything I can do? My answer to Question 3. Is there anything I can do? 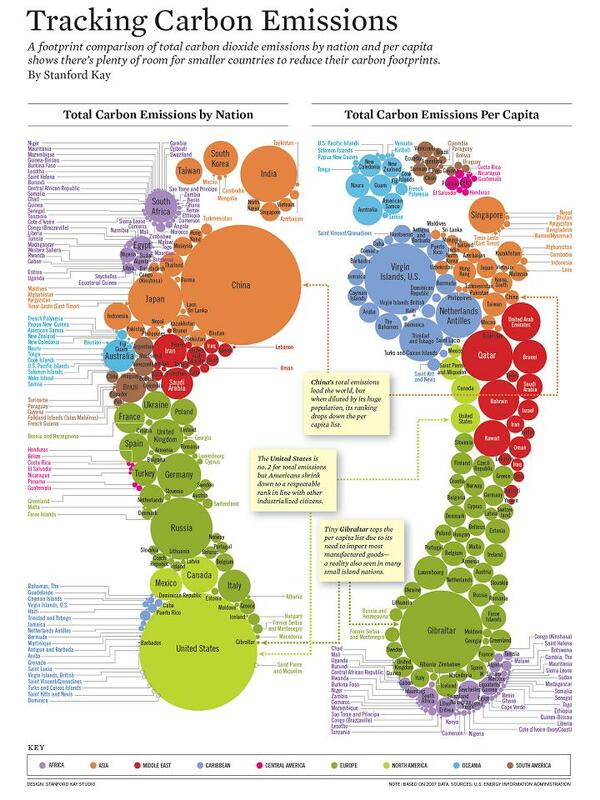 First let us look at the so called carbon footprint. These feet are from 2010. I would like to acknowledge Stanford Kay Studio; a version of this graphic first appeared in Miller-McCune. Thank you, Stanford! Copyright Stanford Kay 2010. China has the largest carbon footprint in the world, followed by the United States, but when it comes to carbon footprint per capita Gibraltar is number one, followed by the U.S Virgin Island. How can that be? Everything in Gibraltar must be imported, and nearly everything is imported to the U.S. Virgin Islands. The solution to lower the carbon footprint is to produce and buy local, and eat things produced in season. Pipelines has less than half the carbon footprint of the same substance transported by rail. Transport by rail has much smaller carbon footprint than transport by truck. Electric cars make no sense as long as electricity is produced by fossil fuels. The extra energy consumed in manufacturing the batteries will never be repaid if transmission and conversion losses are taken into account. Make food from scratch rather than eating processed food. If possible plant a garden and eat fresh vegetables. Even a window pot with chives makes the sour cream tasty. A rosemary pot is wonderful. I could wax eloquent, but you get the point. Don’t ever buy CFL light bulbs again, and don’t throw the old bulbs in the trash. Sometimes in the future we will have to mine the landfills. A lot of stuff is flown in from abroad, very energy inefficient. Work to make it locally. Previous Previous post: A Climate Realist’s not so short Answers to Hard Questions About Climate Change. Question 2 (of 16) How much trouble are we in? Next Next post: A Climate Realist’s (not so) short Answers to Hard Questions About Climate Change. Question 4 (of 16) What’s the optimistic scenario?